Frogg Toggs Cascades Review: Are rubber waders still worth buying in 2017? 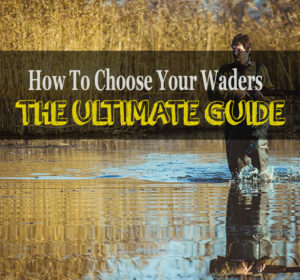 Traditionally waders are made out of rubber. While broadly used years ago, neoprene slowly replaces that Material, if you look at the trends. The Frogg Toggs Cascades are bootfoot rubber waders and in the lower price range. I wanted to see if this material can still compete with today’s standards and that’s why I reviewed them. I always try to review products unbiased and therefore review this product as every other I did so far. Frogg Togg promises “ultra light vulcanized rubber technology”. In theory vulcanizing should make rubber more durable by using a chemical process to add sulfur to it. This is also supposed to make rubber less sticky and it worked, the rubber is not as sticky as for example rubber gloves. Judging the durability just by looking at a material is not really helpful, but in general, you can say that rubber is far less durable than neoprene. There is not much to say here. They have an inside pocket but the external front pocket is missing. They don’t come with a wading belt but have an adjustable chest draw cord, which definitely is not meant to replace said belt. Non-insulated rubber boots, that cool your feet down while your legs are sweating. This is as bad as it sounds. If I plan on reviewing a product the first thing I do usually is test under real conditions. A few three to four-hour fishing sessions usually give me a good understanding, if a product is worth the money. I did the same here and honestly after the first two hours I really did not look forward to review the Frogg Toggs Cascades any longer. Even though it was a relatively cold day, my legs were sweating right from the beginning. For reference, I was wearing a normal pair wool pants. This makes you incredibly uncomfortable and can really take the fun out of fishing. You feel them on your body and that is something I really do not appreciate. One week later I tested them a second time and after one hour my socks felt oddly soaked. I was expecting to sweat again but this was more than sweating. After another half an hour I could no stand it anymore and left the water to check what was going on: On their second use this pair already leaked right over the boots! They filled up with water. Usually, I would assume that this is simply a random construction flaw and exchange them against a new pair, but i checked the amazon reviews and their are many people having the same problem. I sent them back and got a refund without further questions. At least Frogg Toggs customer support does a good job. I like Frogg Toggs, they usually make quality waders. The problem with this pair is, as mentioned earlier rubber is considered outdated in the outdoor industry. 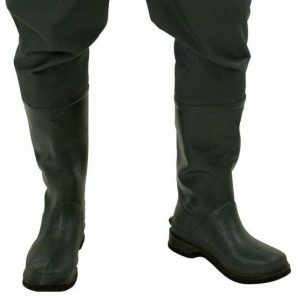 While still used by farmers because rubber waders are really easy to clean and have a high resistance against chemicals. There are no advantages over neoprene when you plan on going fishing or hunting in them. Rubber waders are less insulating, rip easier and therefore are also less durable and most importantly they are the opposite of breathable. I can almost guarantee, you will sweat in rubber! 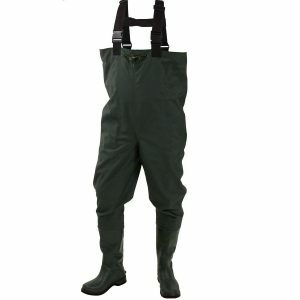 If you want Waders for fishing, check out my Review about the Frogg Toggs Amphib, quality made neoprene Waders that will fit your needs way better. I too was very dissatisfied with this product. My son and I wore them 3-4 times for 3 or 4 hours over the course of the last year. I think they were leaking by the end of the second time, a little. And a lot by the end of the 4th time. And we really did not abuse them at all, taking care to clean and dry them properly after each use, not tussling with barbed wire, etc. Best to save your money and buy some breathable type of waders with wading boots in $200 range for waders and boots. Reddington seems to be working pretty good for me now, and Cabelas before that. I tried rubber waders years ago too when i had no money–they were bad then, still bad now…. Thanks a lot for your comment Anthony!